This visually and poetically stimulating new book exhibits a rare tapestry of feminine identity. Dohan and Gillerman-Harel juxtapose visual text with narrative pictures exposing the side effects of love and moments not spoken. The book contains texts and photos showing a diverse and honest representation of women removing their masks. The Israeli figures, some of whom are publicly known and famous, poetically expose themselves, forming an intriguing outline of the feminine body and mind. Much of this book is about defiance, irony, the immortalization of feminine beauty, the conflict between the different roles of women in the modern world and the expectations they need to meet. The book also contains optimism and hope, which emerges in the not-so-glorious and less pleasant moments of love. With their words and pictures, Dohan and Gillerman-Harel attempt to create a new feminine "self", one which is both fantastic and real, removing the exterior layers of women and showing the true life lying hidden underneath. 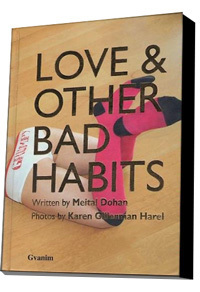 "Love And Other Bad Habits", published by 'Gvanim' in Israel in July 2007, was part of the exhibitions project in The Women's Festival in Israel in 2006, exhibited in the feature event of "The Beauty City" in Israel in July 2007, and presented in many exhibitions in Tel Aviv. The third edition of the book has just been donated to the organization "Ladies Circle". The book is presently for sale in various stores in the U.S. such as 'Crawford Doyle' and 'Bluestockings' in Manhattan. Meital Dohan is exploring the power of magic, but not the abrakadabrah kind, the magic in our everyday life. In her radio show, "Loud Miracles," she interviews people who have encountered and experienced miracles in their lives, and people who bring miracles to other's lives. As Meital has said, "Miracles are when the impossible becomes possible." "Loud Miracles" also features music from promising up-and-coming artists.